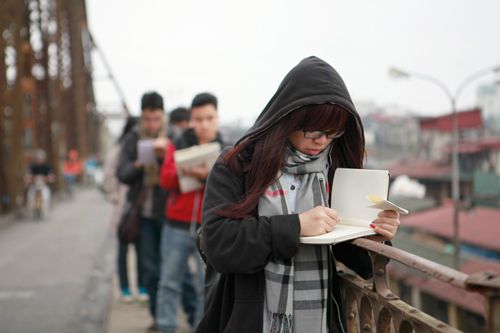 HA NOI (VNS) — In a bid to generate the love of old architecture among students, an event was held wherein hundreds of them spent the day at the historic Long Bien Bridge yesterday. Despite the rainy weather, these architecture students from universities here spent the day sketching the bridge, a national historical and cultural landmark. 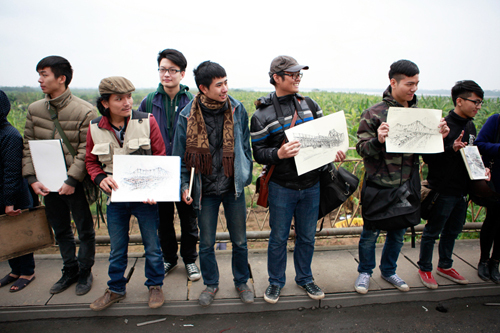 The event was held by the Architecture Club and called Long Bien Bridge – Forever Love. It was held in response to the prime minister's call for preserving the bridge. "This is an opportunity for the students to upgrade their knowledge and learn more about architecture and the historical values of the bridge," said architect Dinh Hai, from the organisation board. "The best 112 sketches representing the age of the bridge will be selected for display," stated Hai.